Christopher Columbus came to North America in 1494 with a boat load of trained work oxen. 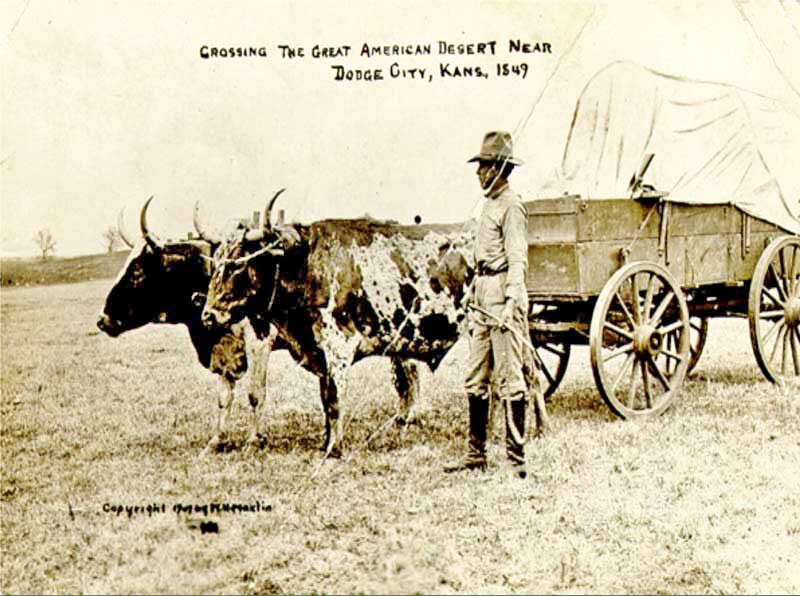 To the opposite of some opinions, the cattle were trained to pull plows, wagons, timber and build roads. 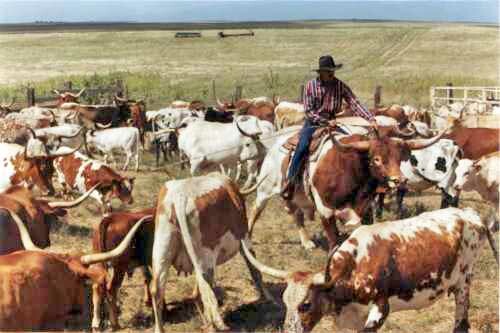 The early ancestors of modern day Texas Longhorns were selected and bred for disposition. 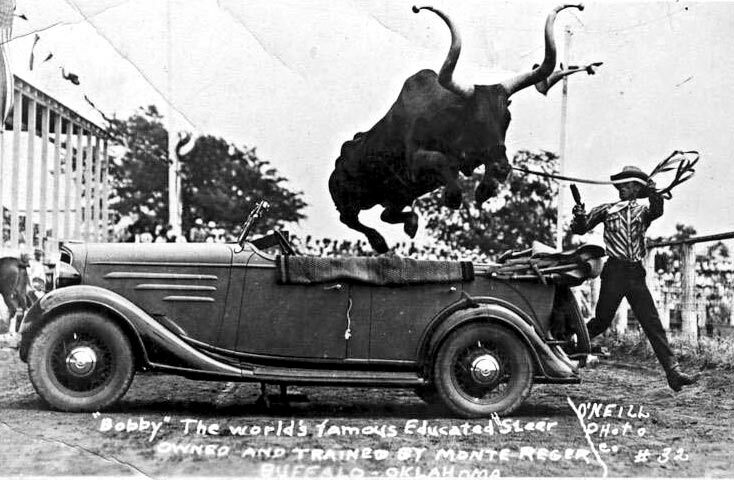 It was over 100 years later when Spanish fighting bulls were shipped to Mexico as sport cattle. 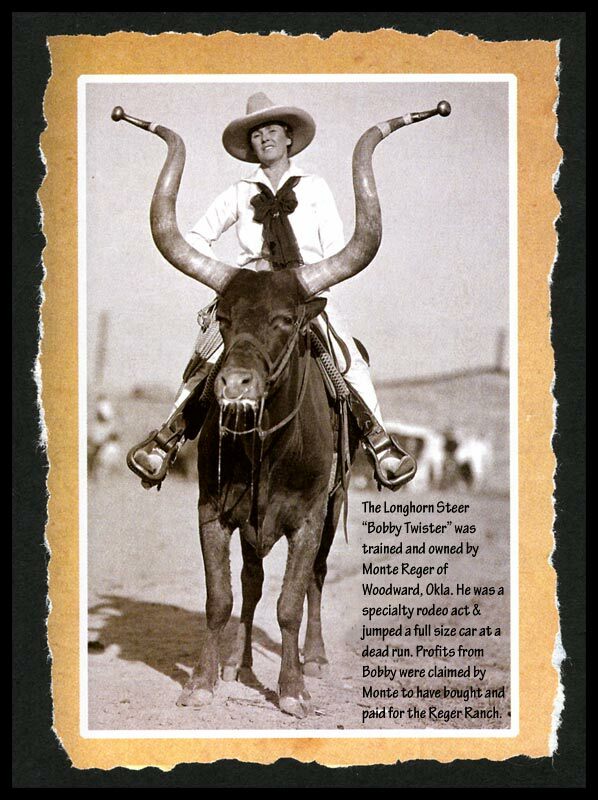 The Texas Longhorn was not related to the wild fighting stock. 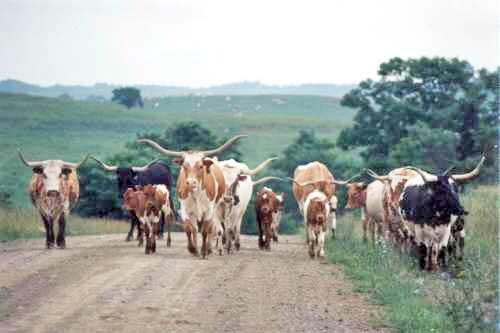 The docile disposition of early Texas Longhorns made them the animal of choice for pulling thousands of conestogas westward, many over the old National Road. 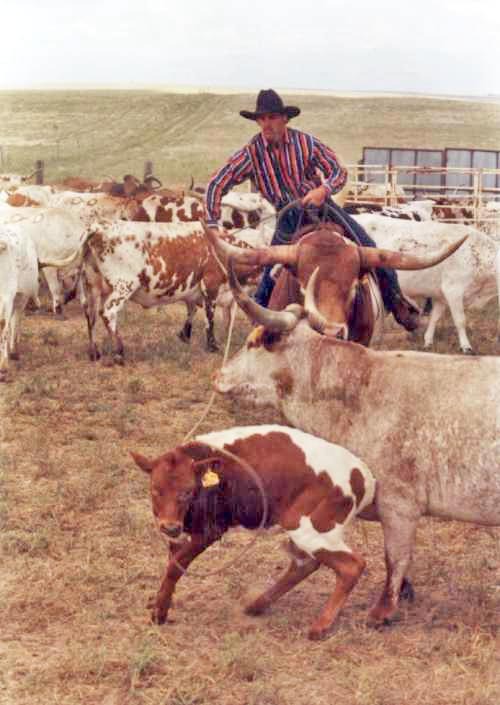 Today this intelligent disposition makes Texas Longhorns much more easy to handle than other breeds. Ramblin Rose was a cow that gave too much milk for her calf. Each day 1 gallon was collected for house use. She raised a calf and provided for the ranch families. She was never tied while milked. A little grain was all it took. 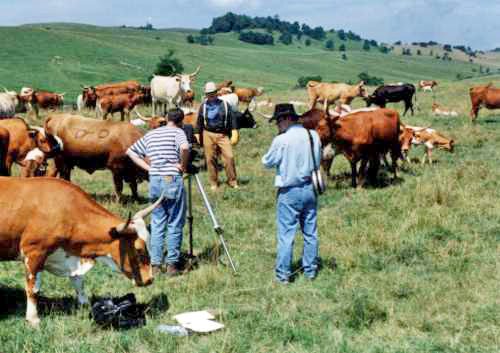 The major DCC herd sires are gentle and often visitors want photos taken with the bulls. This is Senator with Linda and Darol Dickinson. 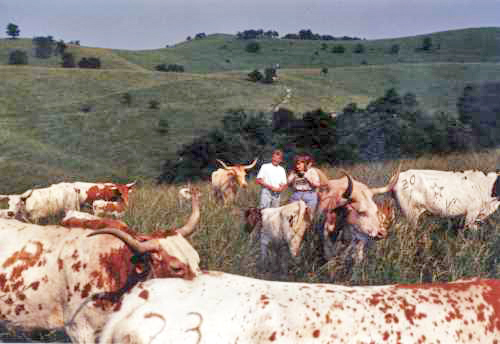 Hundreds of children enjoy showing Texas Longhorns at halter. They are beautiful to exhibit. 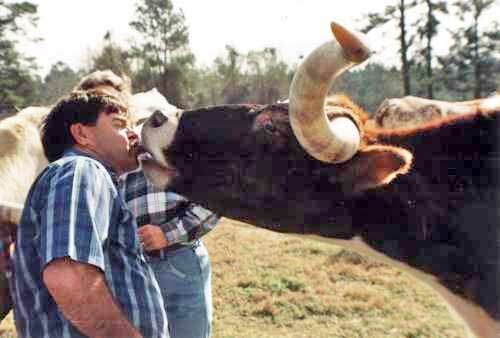 Never kiss a cow unless you desire a long term relationship. 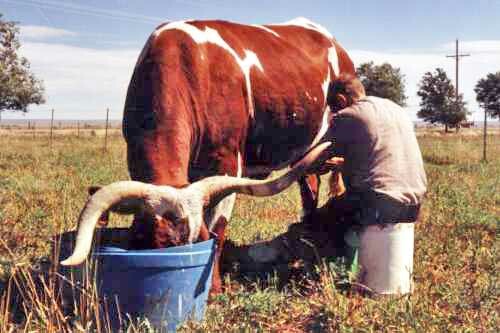 Longhorns love to make friends. 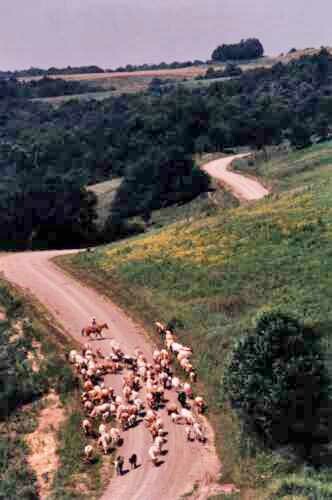 DCC Longhorns are moved down township and county roads in Belmont County, Ohio. Prospective new longhorn owners looking at the herd. 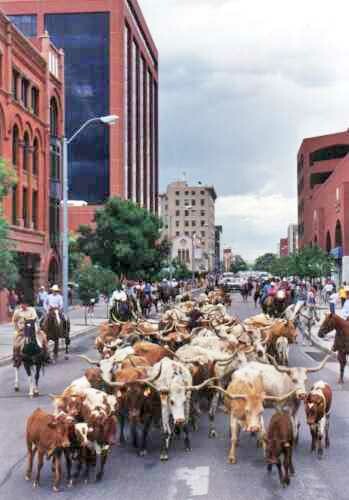 This DCC herd of 100 head was driven down the main street of Colorado Springs, Colorado. 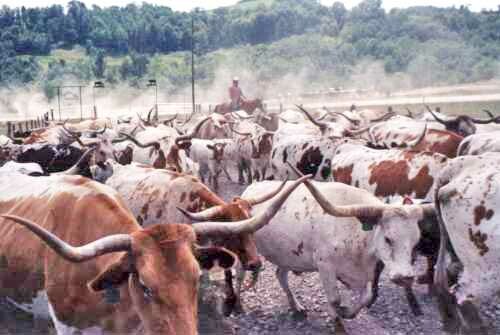 Although the city fathers almost had a coronary, not a single cow was out of line. Gary Lake trained Zhivago to ride, rope and wrangle. His gentle ways made him better than a horse. 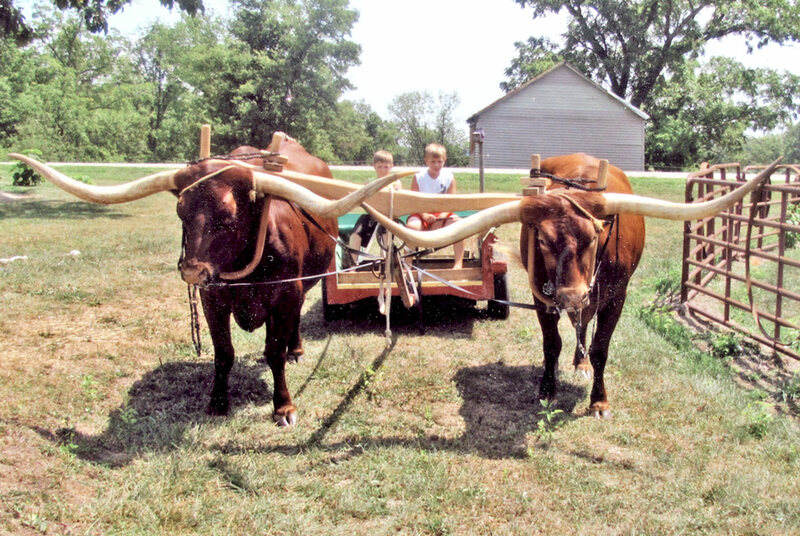 Longhorns are easy to drive by foot, horse or 4 wheeler. 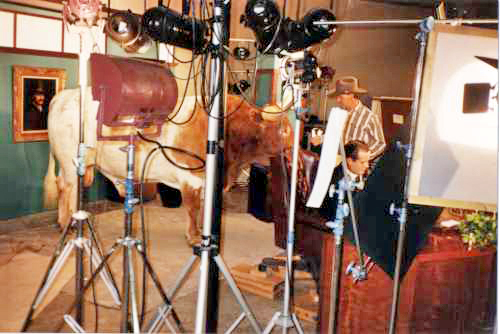 Numerous film crews have used DCC Longhorns for commercials and intros. They are curious and do like to check the scripts. Zhivago made a great roping mount. He out weighed most horses by double. 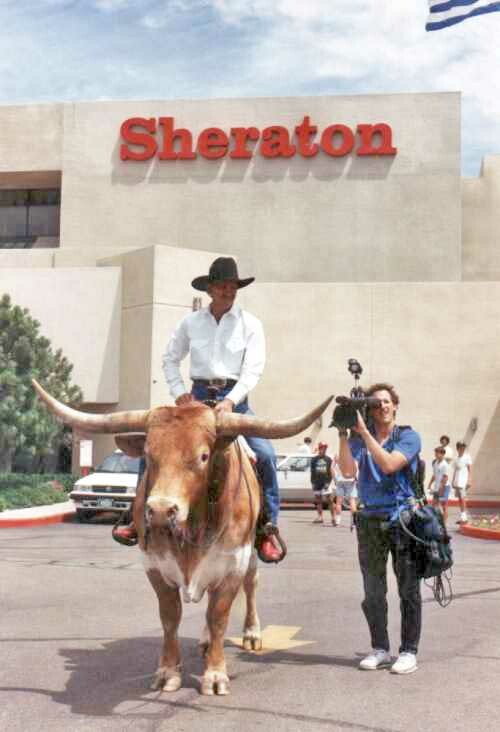 The cows were not afraid of him. 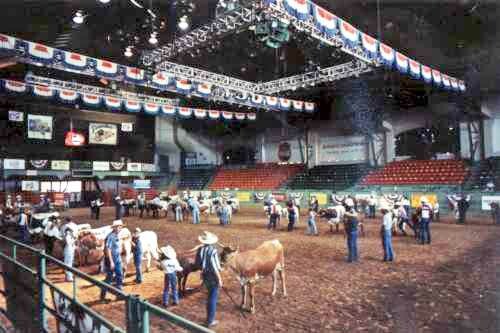 The DCC raised and trained herd sire "Zhivago" created more attention than an Elvis sighting. 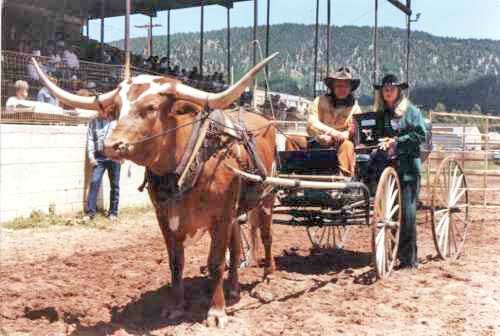 Riding Texas Longhorns is a family affair. 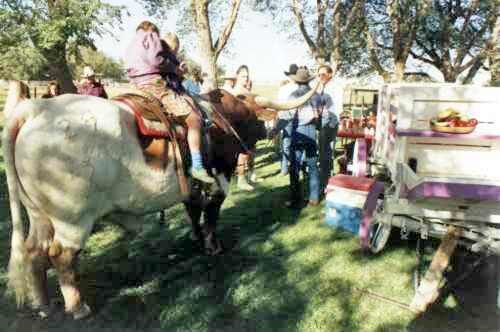 They are great for parades and learn to ride faster than most horses. 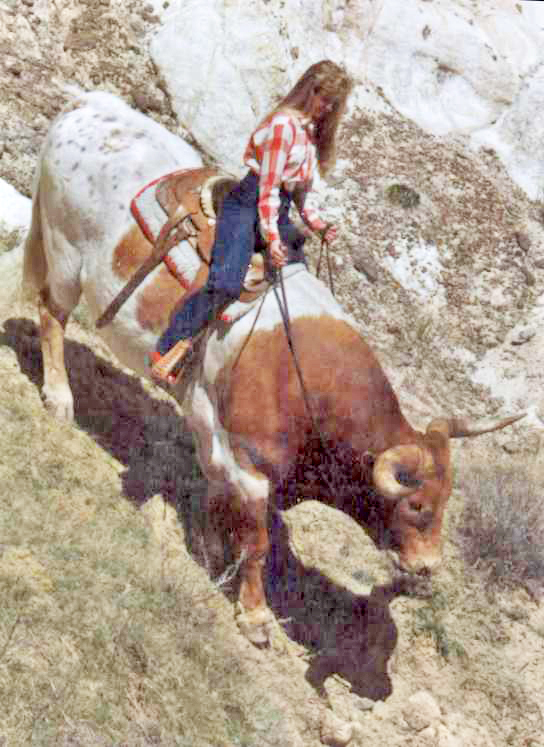 Dela Dickinson Lenz riding a DCC herd sire "Zhivago". 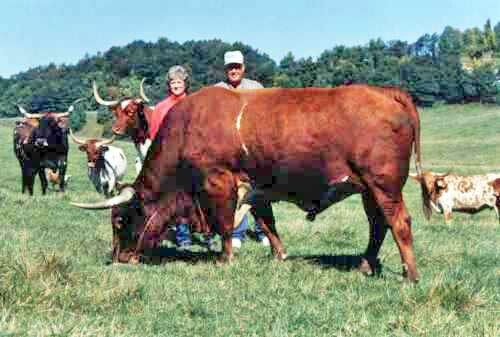 Everyone should include their Longhorn herd sire at lawn parties. There needs to be something for the kids to play with. 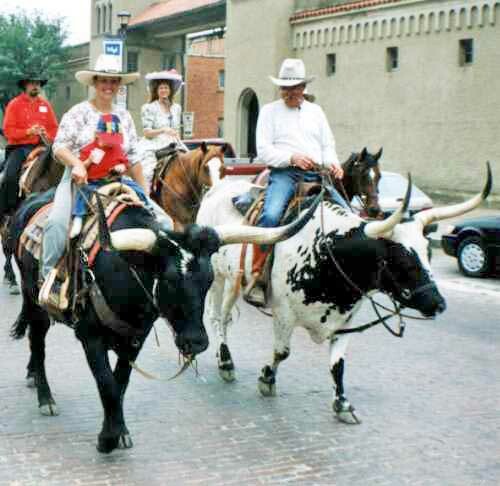 Normally one rider can move a hundred cows about nine miles per hour. Zhivago was very profitable for bank and automobile TV commercials. His deportment was perfect.